Our second set of commands include those used to CREATE and DROP tables, as well as to DELETE records. With an understanding of this growing collection of commands, suddenly much of what could be referred to as regular data management and query is attainable (with practice, of course). On to some slightly more advanced SQL topics. First, we have a look at views, which can be thoughts of as virtual tables populated by the results of queries, useful for a number of different scenarios including application development, data security, and eased data sharing. For beginner SQL practitioners in the data science realm, I would call views a "nice to have." Since the focus is likely to be more on data exploration, I would say that the next topic, joins, is a "must have." Joins come in different flavors, and likely one of the more complex topics you will cover while learning SQL is getting them straight. That's really more of a testament to the ease of SQL than the actual difficulty of learning about joins. 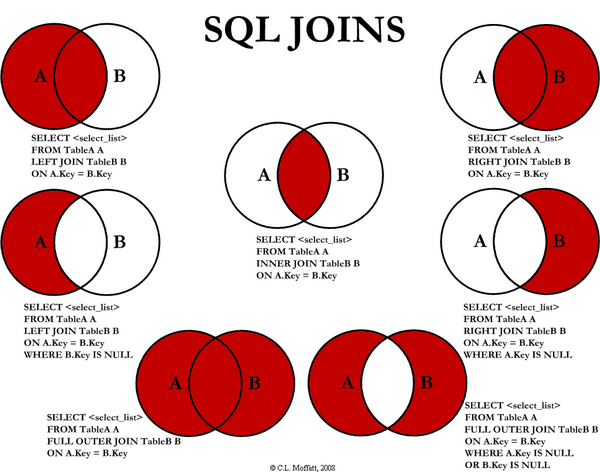 A visual representation of SQL joins. OK, so you've made some headway with learning SQL. You can query some data, create and manage some tables, make a view if you had to, and even use joins in some more complex querying. But why are you learning all this again? For data science, right? Let's take a bit of a break from the technical to get an idea of this very topic. Often we will find that SQL is embedded in, or called from within, software written in other programming languages as part of a larger system. For example, in web development you may find PHP or Ruby or some other language making calls to a database via SQL to input, modify, or retrieve application-related data. In data science, you may see SQL being called as part of some application written in, perhaps, Python or R. To that end, having an understanding of how these languages play with SQL is not a bad idea. SQL queries with Python and SQLite.